PHILADELPHIA—If little victories lead to more significant victories, there is a glimmer of hope in the case against political prisoner Mumia Abu Jamal, according to supporters. Judge Tucker extended the period of discovery to allow the search for more evidence that may link Justice Castille to the new document. The new court date for arguments is scheduled for Oct. 29. This letter came to the attention of the court on Monday, Aug. 27. While on the letterhead of then-District Attorney Castille it was uncertain who sent the message. Judge Tucker appeared miffed that this piece of evidence had not been turned over to the defense earlier, before announcing his decision that the case would be continued. The judge also asked that a paralegal not be used in the new search. Attorneys for the former Black Panther, who spent 29 years on death row following his conviction in the 1981 murder of Philadelphia police Officer Daniel Faulkner, are petitioning under the Post-Conviction Relief Act to have his previous appeals thrown out to make way for the new appeal. 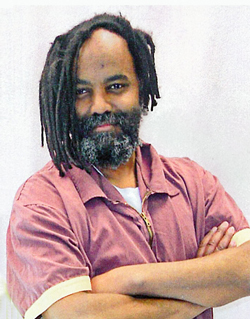 Mr. Abu Jamal’s legal challenge is based on a recent U.S. Supreme Court decision in the Williams case, which ruled that an appellate judge cannot participate in a case in which he formerly had a personal role in a significant prosecutorial decision. The critical point is “personal role” which is what Mr. Jamal’s attorneys are trying to establish with Justice Castille who was the Philadelphia district attorney at the time of Mr. Jamal’s conviction. Mr. Castille also refused to recuse himself during Mr. Jamal’s appeals. According to Mr. Abu-Jamal’s former attorney Rachel Wolkenstein, the letter was a significant find because it raises all sorts of questions. 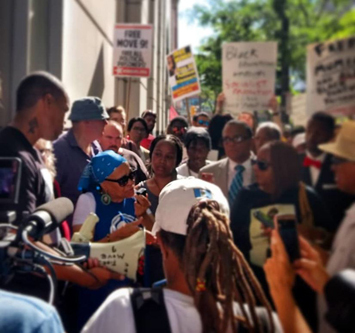 “The letter from a member of Castille’s staff to a state legislator stated nine people should be certain to be executed and Mumia is first on the list,” she said. “What is troubling,” Ms. Wolkenstein said, “Is Mumia’s case was still on direct appeal at the time the letter was written. His appeal was not decided until the following year. So it raises many other questions about why and what basis would the name of somebody who had not gone through his first appeal be on a list of people requesting death warrants signed against them. “Right now there is a limited amount of discovery that was granted by the DA. What was granted shows that in many different ways Castille as district attorney was actively involved in developing a policy and pushing for then-governor Casey to sign execution warrants as soon as possible against anybody that was convicted of a capital case. In particular, he was urging the governor to make a dramatic show that the death penalty meant something in Pennsylvania by signing warrants immediately against people who were guilty of killing police officers,” she pointed out. Maureen Faulkner, the slain police officer’s widow, was present for the hearing having flown in from California. Holding a press conference outside the courthouse following the hearing she thanked the District Attorney’s office for the support it has shown. John McNesby, president of the Philadelphia Fraternal Order of Police, was with her. That is precisely what supporters of Mr. Abu Jamal, who came in for the hearing from as far away as France and Senegal, are hoping for. Roger Wareham, human rights attorney and member of the December 12th Movement, spoke at a press conference held the previous day. “Mumia is guilty of breathing while Black and struggling while Black and that is why he is in jail to this day. There must be a mass mobilization on his behalf. It is that pressure that the United States, in general, will respond to and the Philadelphia District Attorney Larry Krassner will respond to,” he said.